Dressing for my baby bump has been more fun than I expected. I definitely wasn't sure about how easy or difficult it would be. I know that I wanted to be comfortable and still fashionable. This seasons loose pants and shirt dresses helped to make getting ready in the morning one less item to stress over. 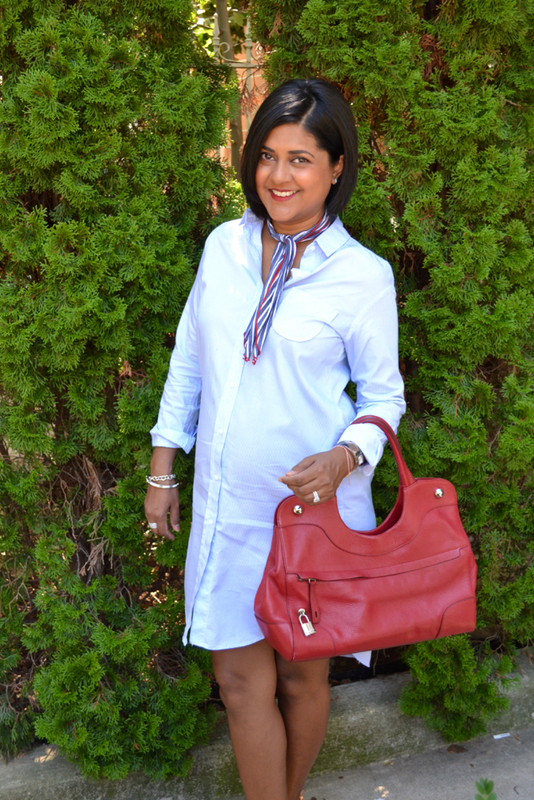 This Zara shirt dress has been on heavy rotation since my first trimester. I knew when I purchased this, I would be able to wear it throughout my pregnancy and afterwards as well. Transitional pieces are key! I am usually carrying small purses or a backpack but pulled out my Furla purse that I've had for some time. It's bigger but I figured I will be carrying a baby bag soon so I may as well get used to it! I am definitely on the search for a cute baby bag so I am open to any suggestions, please! Finished off this outfit with my Donni Charm necktie and open toe booties I picked up in Rome. Let's see how much longer I will fit into this dress!! !